I hope you had a safe and wonderful New Year with your family and friends. This time of year there is tons of talk about resolutions. I was never much into the act of making resolutions. Who keeps those, anyway? I would scoff at people who would resolve to eat better or run a marathon and move on with my day. I think part of that is from being young and idiotic (it’s ok, we’ve all been there. It’s ok to admit it. ), and part of that is as a college student I very much survived day to day. Maybe a resolution for the year was “pass all of my classes and graduate someday”. Beyond that, I would just see what life brought me! On my honeymoon, I decided what better time to catch up on reading for pleasure! I’d resolve to read a book a week until my first anniversary. I could do that, right?! Did that happen? Of course not! The following year I decided I’d read a book every two weeks. Did that happen? Nope, it sure didn’t. I came into this year thinking, I’d struggle through trying to read one more book than I did last year. I’d have a baby all year long, so surely, I won’t be able to read more than last year. Around the same time, my awesome Sunday school teacher, Jeff Hubbard, did a lesson on goals vs. resolutions. With a resolution, you don’t give yourself an leeway to to make mistakes. You either do or your don’t. So little in our life is black and white, why would we resolve to do something new that isn’t already easily in our capacity? No wonder we don’t keep our resolutions! I’m not surprised that we give up on resolutions all together, actually. So how do we change that? With a goal, we are still striving for an end, but any progress on the path is just that, progress! Goals are not black and white. Now you may say, this is just a debate of semantics, but if we change our thought process around these ideals that we’re setting for ourselves, maybe we won’t feel so defeated if we come up a little short. Maybe, if we take them in tiny steps instead of giant leaps, we can tackle even more than we expected! That really motivated me to make some goals for 2014. 2013 was a big year of change, and with change comes expense! We bought our first home, our first vehicle as a couple, and we welcomed a sweet baby boy into the world. With all of that, I was really motivated to set some financial goals for our family. I wanted to be a family who lived well within our means. I wanted to read more books than in 2013. I wanted to give consistently and give more. So I wrote it down. **TIP** Download an app called Goal Tracker. You can input each of your goals and break it down in days, weeks, or months. You can set reminders to go off on your phone, and it will break down all of the percentages for you. It even has a pie chart if you prefer pictures over numbers 🙂 We didn’t use this app last year, but we are using it this year and, so far, I really like it. With this new outlook on goals vs. resolutions, I wasn’t discouraged by the goals I didn’t reach in 2014. I looked back and knew I’d made progress, and then put it on the list of goals for 2015, while also evaluating how I could do better. What I did find was that breaking down our goals made them that much easier. We eliminated debt and put some extra on the house. We doubled our savings. We set up a separate bank account for giving and because of it were able to give in abundance, compared to 2013. I not only read more books than 2013, I read a book a week and surpassed 16,000 total pages. Even I would have never guessed that a year ago! My mind was blown when I took the time to look at all we’d truly accomplished in 2014. So as we enter 2015, I’ve written things on paper that I would have been scared to even whisper aloud a year ago. I’ve always desired to write a book and I have hopes of cranking out a first draft in 2015, no matter how rough it might be. I want to walk the Susan G. Komen 3-Day in San Diego this year, but that means raising $2300 (and paying for plane tickets and hotel rooms). I want to raise $7000 for TAOE on top of that. I want to send 15,000 Christmas cards to veterans across the country. I want to drink more water, read even more books, and reduce the amount we owe on our house by 20%. Those, of course, are all tangible. I also want to be a better wife, mother, daughter, and friend. I want to pray more and talk less. I want to give more and want less. I want to be open to where it is I’m supposed to be, and be grateful for each day that it takes me to get there. I want to finish better than I started. As we enter 2015 together, I hope you’ll take 30 minutes to sit in stillness and ponder what it is you want for your year. Tangible and not, what do you want to do better? Write it down, tell a friend, and pave the way for you to get there. I’d love to hear some of your goals for 2015, and I hope you can encourage others in their goals as well. Oh, and of course (because I really like to give things away), one of you lucky readers will win this little goal setting gift pack. It’s a gorgeous mint and gold! 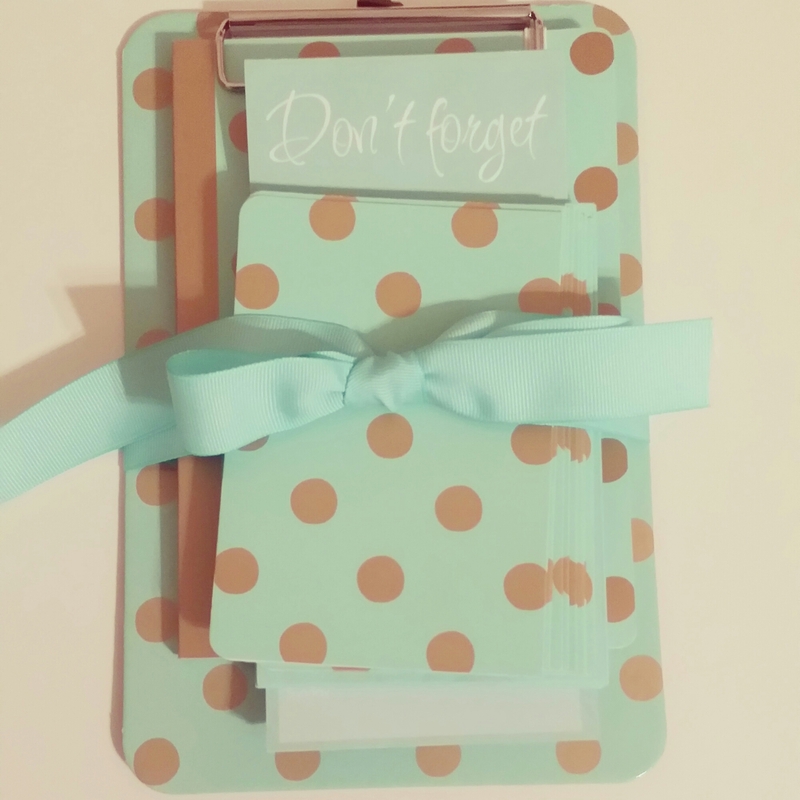 You’ll get a mini clip board, journal, magnetic to-do list, and 8 notecards to help thank and encourage others. All you have to do is share one of your goals for 2015! Share this with a friend (and tell me you did) and get a second entry. I’ll pick a winner on Sunday! One of our goals for this year is to pay off half of my student loans! We got all of my husband’s paid off last year! That’s awesome! You can do it! since I have had plenty of time to sit and think about this new year I have come up with some tangible goals and some lifestyle goals. My first and most important goal is to slow down, enjoy my family and make more good memories. Tangible goals are to reduce debt and learn to live on less so I can save for a home. I have been writing down ways that I can do this and encouraging my daughter to be a part of this. I want more contentment in my home. These may be simple but to me they are very important because I will also be teaching my daughter these values. That’s a wonderful goal, Rhonda! R is a sweet girl. You are doing a great job! I have a few fitness goals and a few financial goals BUT the most important goal I have this year is to get active in one of our local churches! I have had a hard time feeling at home at a church since we moved her FIVE years ago… Starting to thinking it’s me! I am praying for God to lead me in the direction he wants me to go! I have no doubt that he will! That’s a wonderful goal, Jeana! I’ll be praying you find a place that feels like home. Stick with it. Sometimes it just takes some consistency to get comfortable. My goal is to lose weight I seem to have the same goal year after year. 2015 is the year I know I can do it! 2014 was a very heartbreaking emotional year for me! 2015 will be great no surgeries “knock on wood ‘ I will pray daily for good health and healthy choices!! I will pray that my family will be happy and healthy and they will be blessed beyond belief. I will do this!!! If not I will keep trying never quit trying I have the willpower and maybe this year will be different! Wish me luck! Absolutely, Lisa! You can do it. 2015 has to be a better year. Praying blessings for you, sweet friend! I’m really wanting to eliminate a good portion of my debt. I like how you said to break down by day, week, or month how I’m going to accomplish my goal. It’s easy to say that we have goals but making a plan of action is the most important part. Thanks Ashley! You can do it, Jessica! It feels so good to get rid of too! My top goals for 2015 – to be more patient, more understanding with the teen in our house & to get back the bond we once shared that I let disappear with my sweet bug’s arrival in 2013 … to obtain my red jacket by June & directorship by years end … & finally, to decrease our debt & find our forever home (one that will be closer to all sides of our families). Those are all great, Crystal! Teens will be teens 😉 Good Luck! Of course you do! You are an outstanding lady. 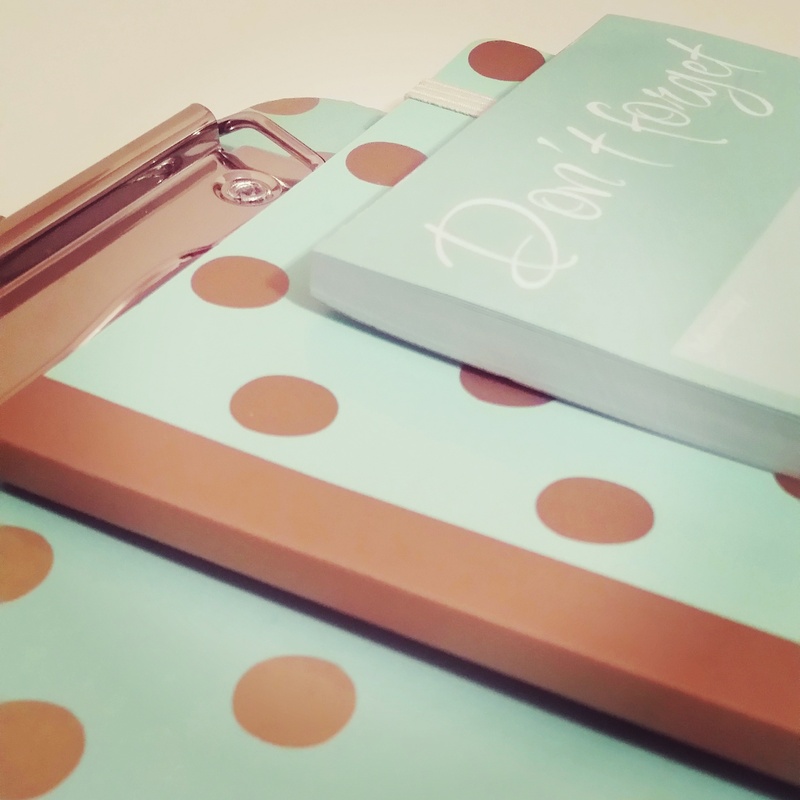 Treat yourself and stay on task in 2015! You can do it! Set little goals to help you reach the big ones! This year I am going to try and take better care of myself. Put myself first once in awhile. I am not very good at that. Also to build up our savings and start a garden. My goals are having a kinder, more giving heart, to become more organized and time efficient, run our yorkie rescue successfully, and hopefully be debt free by Jan. 1, 2016. I am sharing your blog and hope to read all your future posts for my inspiration to accomplish my goals.